FLAT...all the cool kids are doing it. SIDE NOTE: As I compose this sweet post, I am officially one day away from summer break! That means no more work, no more lesson plans, no more getting ready every morning at 5:30, no more make up and hair every week day. No more pencils, no more books, no more teacher's dirty looks! Ha, that would be MY dirty looks!! 450 QUICK DRY ADHESIVE to stick down my chipboard letters. This time I got all sorts of crazy and used the tape runner instead. It held 'em! Bam!! More bang for your buck!! If you don't use or have (several) QUICK FIX ADHESIVE RUNNERS on hand...then someone should beat you with a stick. Consider yourself warned. Knick Knack Paddy Whack.... Give A Host A Thank You Mini! I recently visited my Aunt and Uncle in Minnesota, and we arrived home on Sunday. 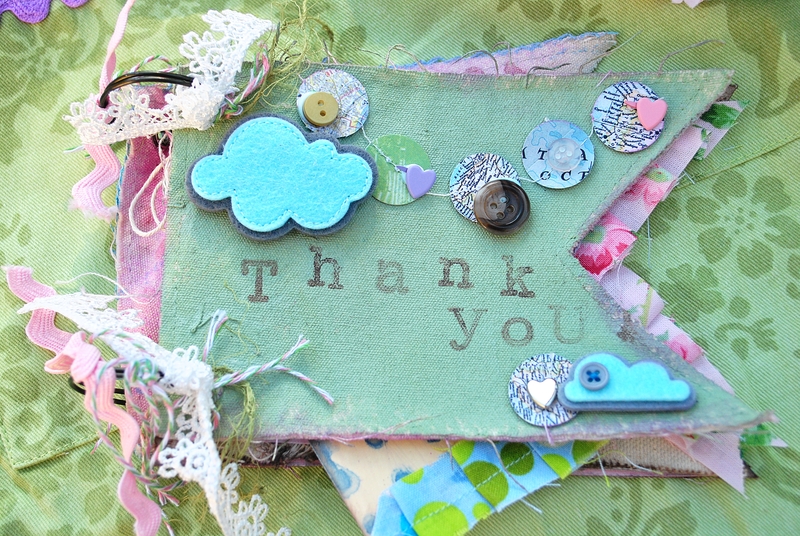 I immediately knew I needed to create a special thank you gift for them, as they were really wonderful hosts to me and my three daughters. As they are "older folks" now, I think we completely wore them out, but they seemed to enjoy themselves and our busy pace. I noticed that my aunt had displayed one of the other albums I had created for them in a prominent place, amongst her knick knacks, as she calls them. So, I decided to make another mini, this time something pretty small, that I could send in a small bubble mailer. I started with these Maya Road banner/pennant pages, but I only had two, and I wanted to have the rest of the album the same shape, so I figured it was best to create pages of my own, using some scrap chipboard and canvas fabric. How to adhere the fabric seamlessly? Helmar to the rescue!! 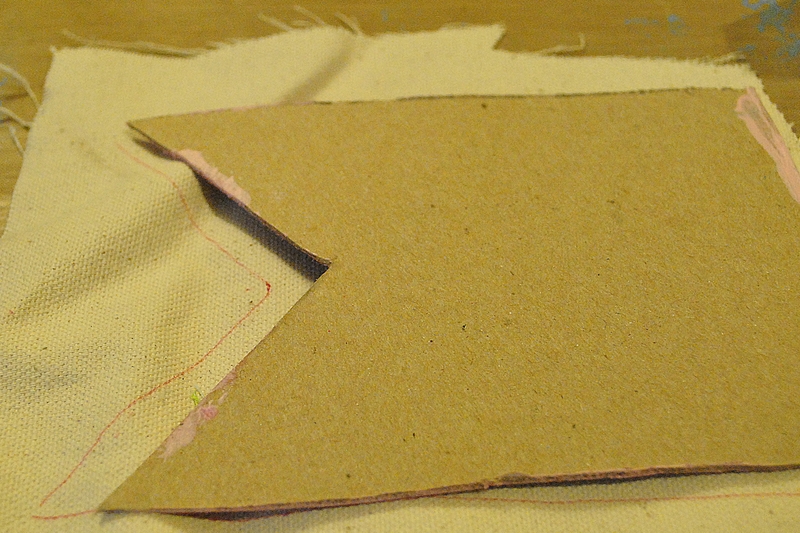 I just traced the Maya Road page onto the chipboard, and then traced a line around the outside, onto the canvas fabric. Because I wanted this pennant to have a cohesive look, to the others, I frayed the edges by pulling the loose threads. As an aside, I guess I must fray things a lot, because I was watching my daughter sew some shorts for her Etsy shop the other night, and she stopped and pulled the threads to fray the edges of the denim.......for one hour. She thought it just wouldn't look right otherwise. Ha! Next, I pulled out my Helmar Decoupage Glue (I <3 it, could bathe in it), and spread it onto the chipboard, using the awesome, trusty glue spreader. Because this canvas is fairly heavy fabric, I also spread the decoupage glue onto the back side of it, before adhering the two. Yes, that is a butterfly stamp on there.........this was a "discard" fabric piece from another project....and was recycled for this project, because it wouldn't be seen on the other side. And here is the finished page! Easy as pie! 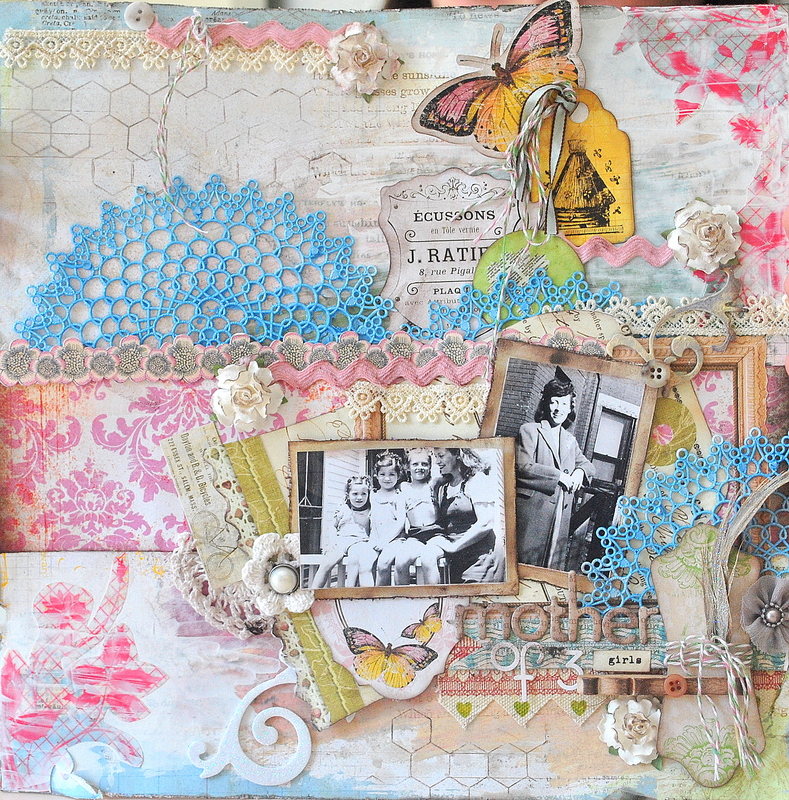 Helmar Decoupage glue made it bubble free, seamless, perfect! I did the same thing on this other piece, only with lightweight cotton fabric. I only put a light layer of the glue on the chipboard itself this time (not the fabric), and then along the three seams, and it made a nice taut look that, when dry, could be inked and stamped just like paper! I simply flipped it over, and cut off the excess fabric, and the page was ready to use. I hope that my aunt and uncle enjoy this book, and that it becomes one of my aunt's "knick knacks". I thought that the upcoming challenge (which, just you wait and see, you'll be giddy) fit her favorite things, like vintage, childlike colors, and blooming gardens. I can't wait to add journaling and photos, and pop it in the mail! 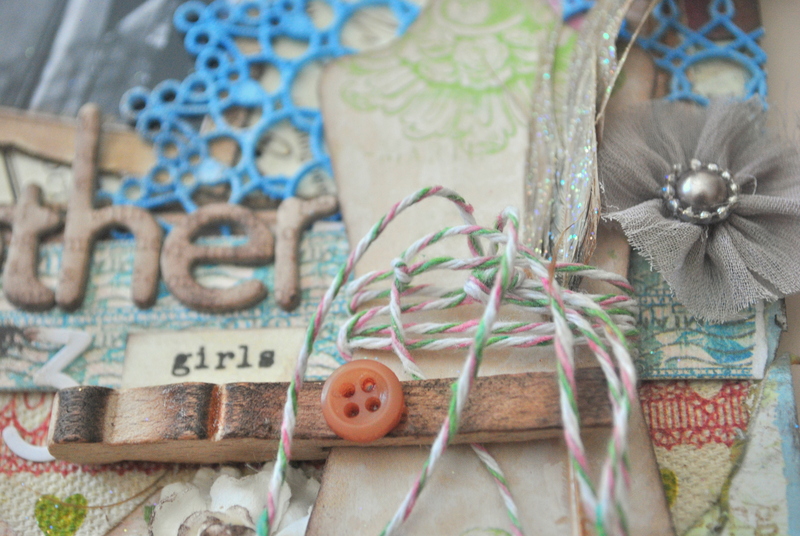 Naturally, I chose the Acid Free glue for all my paper glueing on this page. But 450 Quick Dry did all the heavy work. Large flowers and finicky trims can be tricky to adhere, and the 450 was a big help. I especially like that you can put the 450 Quick Dry on 'open' trims and wire embellishments like these, and it's strong enough to hold - I didn't need to put large gobs of glue that would show from the front. Down here is Adelaide, South Australia the weather has been a tad cold and wintry for sure. Perfect weather for scrapping that's for sure. 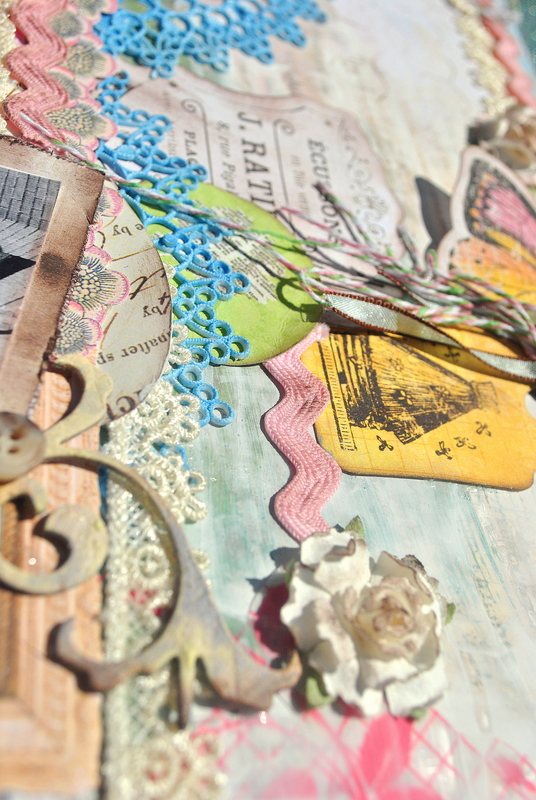 I have been busy hiding in my scrap room. With the lovely colours that Lydell has chosen for next months challenge I have been able to play around with a next set of stamps I got for Mother's Day and some of my favourite Helmar goodies. 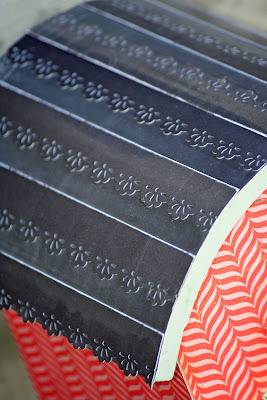 I have stamped the flowers onto contrasting patterned paper then trimmed away the excess paper. I have then curled the flowers to make the petals stand out and then adhered the flowers to my layout using Helmar Liquid Scrapdots to give then varied height. To add a little bling to the layout I have used Helmar Acid Free Glue to hightlight the edges of the flower petals and then added some fine Glamour Dust. This creates the same effect as Kindy Glitz.. but is a great alternative when you have run out of Kindy Glitz. 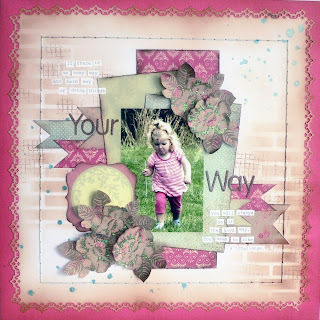 With a little help from Helmar and some inspiration from Lydell I was able to create this super quick and easy layout. Sometimes is it just about creating and recording the moment, rather than worrying about all the fancy things to put on a page. Especially if you are time poor and looking for some inspiration. Thanks for stopping by. I hope that I inspired you to get creative too. We have some great news to share with you today. Take a look at the video and mark your calendars. Add the Helmar channel to your USTREAM Subscriptions. We also have a convenient button right on our facebook page to access our USTREAM channel. and liberty tolls for we. and oppression tolls for thee. For every family member, mother, father, child and friend that has been touched by the bravery of a soldier fighting for freedom. Hello, Helmar fans! 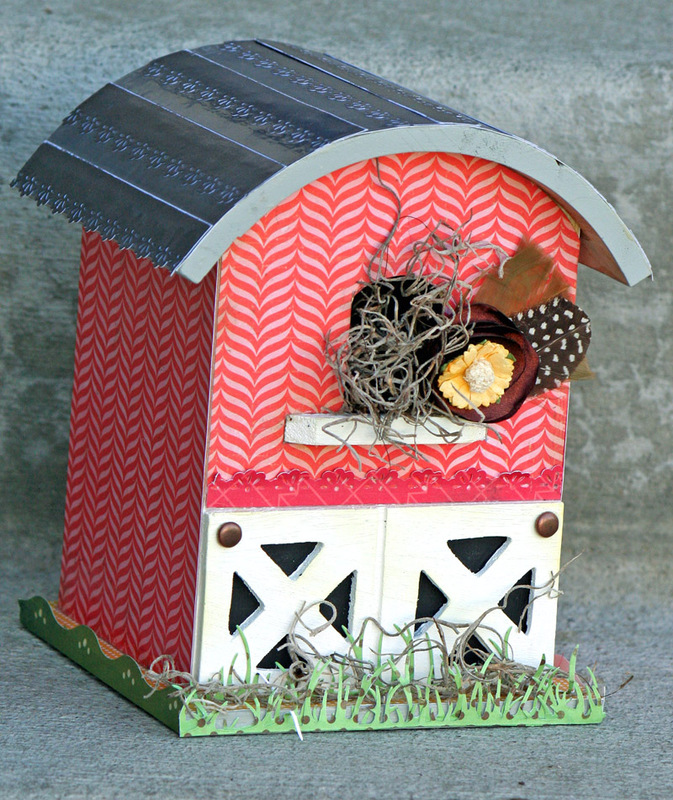 Liz here and I want to share my altered wooden farmhouse with you. I found this little house at my local craft store. It was yelling at me from the shelf to take it home and cover it using Helmar Decoupage and Craft Paste. I obeyed and did just that. 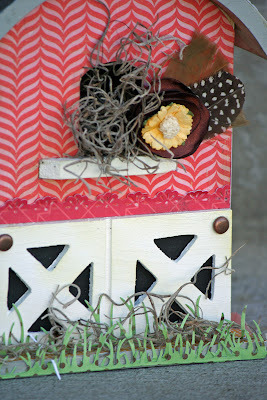 To begin my project, I painted all of the edges of my barn a grey and allowed it to dry.I chose to use the new Storyteller collection from Crate Paper to cover my barn. After I measured and got all of my paper sizes right, I brushed on the Helmar Decoupage Paste with a large paintbrush right onto the barn. I then applied each paper onto the barn and painted another coat of Decoupage over it. I love the firm, shiny coat that it gave my project. To add a little more detail I decorated the barn with cut out paper grass, brass brads, Spanish moss and a feathered flower. Those were all attached using Helmar Craft & Hobby PVA Glue. I thought that I couldn't think of a better way to use the gorgeous, feminine (to me at least) color palette that Lydell found and created for our challenge, than by using these photos of my grandmother and her three daughters, taken in 1947. I mean, you can't get any girlier than that, unless you had maybe 10 girls. Hehe. As the mother of three girls herself, I'm always comforted by the fact that my grandmother successfully raised her daughters (my mom is the littlest girl, on the left), and that she is hopefully whispering encouragement in my ear from above. 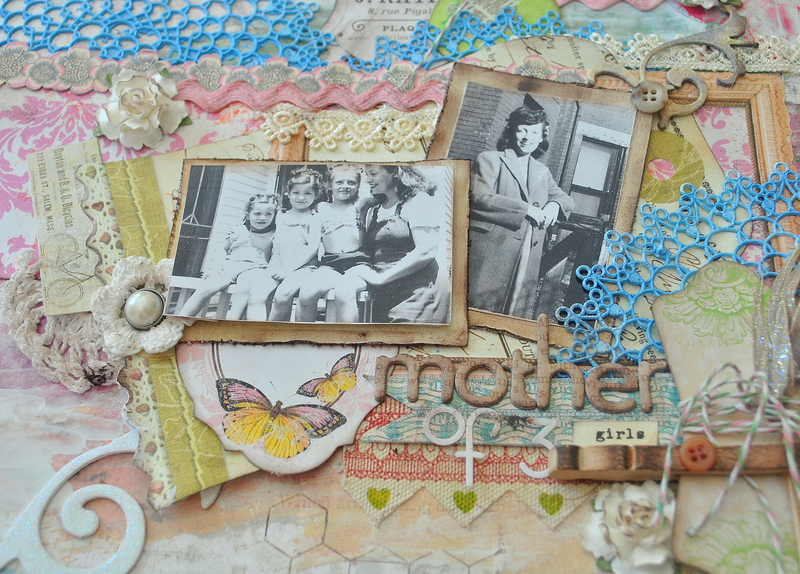 For all of the one-dimensional elements on this page (mostly paper), I used the Helmar Craft and Hobby PVA Glue. When I "wormed it" (my phrase for winding streams of glue) onto the back of the paper, I then spread it very thin using a Pampered Chef stoneware scraper. A old credit card could do the same job...or hey, a new credit card could work too, it would keep you from using it later. Or maybe you could just explain to the store clerk how much you love your Helmar? Anyhoo, I love how the glue then adhered perfectly and smoothly to the base paper, even with gesso and paint and such on it. 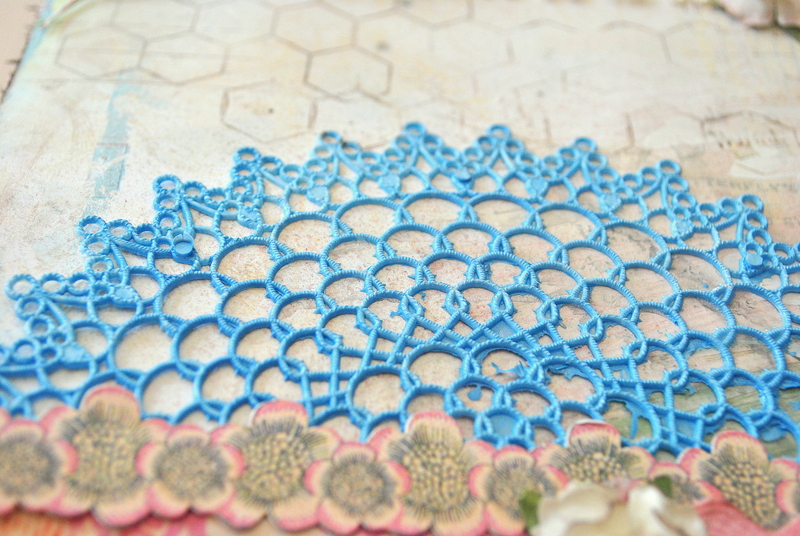 For the very first time EVER, I was able to adhere one of these vintage plastic doilies to my layout, and then photograph it so closely.....because there weren't any glue strings! Helmar 450 did the trick! It spread so nice and thin, but was still re-positionable, AND you can't see the adhesive on the doily itself, or the paper. Perfecto! 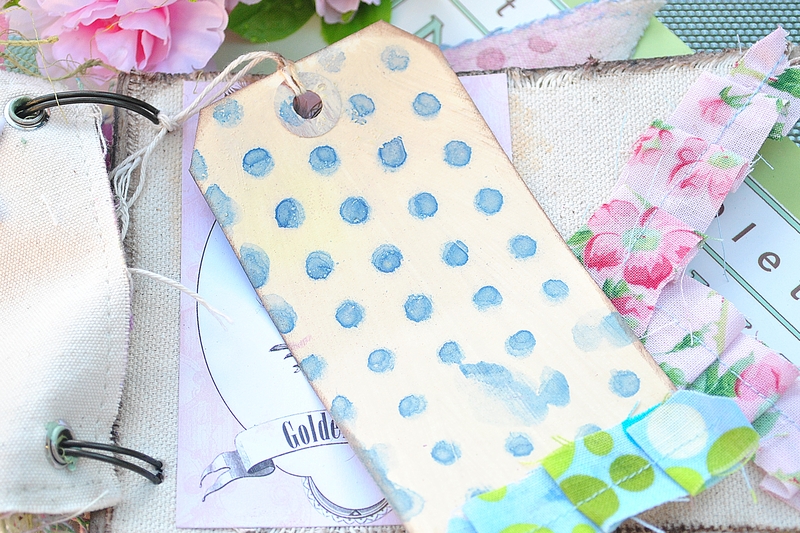 The Helmar 450 Quick Dry was also perfect for sticking this heavy clothespin to the fabric sticker, as well. There's nothing better than security in knowing the clothespin won't eventually be laying at the bottom of an album. Firstly, I noted all measurements of the box, adding 1/4" to each side edge, which allows for scoring and folding over for a neater appearance/finish. This box was where I discovered the idea to use hair elastics for clasping of my memory books and other altered projects. When the 1/4" edges have been scored, cut out the little square corner piece of each and every corner. My adhesive of choice is Helmar 450 Quick Dry for adhering the paper to the box - why, because it is a fast drying adhesive, that still allows for manipulation while drying to ensure all edges are in place with only one glue-session. Gentle persuasion of the paper/glue as drying, allows for a perfect finish. This is the first adhesive I have been able to do this with, and I cannot express how excited I am to come across a product which cuts my 'waiting' time down to next to nothing, does not buckle paper, and gives a perfect finish. Apply Helmar 450 Quick Dry adhesive to the side pieces first, making sure to take the adhesive right up to the very edges of your paper. Without delay, apply paper to box sides one at a time and gently manipulate folds into place. Repeat process with all sides. The reason I apply paper to sides first, is so that no joins are obvious on the front. Also, my reason for using a striped paper, joins are less obvious than a pattern. Measure and cut base paper, slightly smaller (a few mm's) and again apply using Helmar 450 Quick Dry, and the same for the top of the box, using a more decorative paper of your choice. Use a Crop-O-Dile to punch a hole through the centre of the lid of the box, and directly below on front of the box, and insert an eyelet into each hole. Weave a hair-tie from inside through the eyelet hole of the top of the box, adhere using Helmar 450 Quick Dry Adhesive, and allow to dry. I have been a button collector for many years, so I had oodles of fun seeing which button looked 'right' on my project. To attach the button, a wire-tie from a garbage bag was threaded through the button shank. Buttons with shanks are most appropriate for this project, as they allow a gap that the hair-tie can wind over and around with ease. To finish the inside, twist tie around and then spread both ties out across the inside of the box on either side of the button - adhere in place with a smearing of Helmar Silicone Adhesive Sealant. Works a treat! Time to decorate! I have a love of lace, so I found a nice piece which could be cut up, and gave the lace a swipe over with Walnut Stain Distress Ink, giving a more vintage appearance. Also, any areas where the lace may fray when cut, an application of Helmar Fray Stoppa, was applied before cutting into pieces. Helmar Silicone Adhesive Sealant was used to attach the Tim Holts Ideology Foundations (legs), and there is no way they will ever budge! The Helmar Silicone Adhesive Sealant is superb for metal objects, and very little is required to do the perfect job. Decorating was a lot of fun, using a variety of mediums and adhesives to 'match'. Layers of paper, flowers, lace, leaves, and butterflies were adhered using Helmar 450 Quick Dry which allowed me to continue working without having any delays waiting for glue to dry. A light coat of Helmar Professional Acid Free Glue was applied to back of ballerina cut out, and adhered gently pressing with a make-up sponge to remove any small air-bubbles beneath the paper. No buckling of the paper, soooo loveeeee this glue! Metal charms were added using the Helmar Silicone Adhesive Sealant - this adhesive is a must have for anything metal, though can be used on most surfaces, including concrete. Gemstone Glue was applied to the areas where beads were reuqired, and there is no way those beads will ever come loose. Hi guys! Jamie back with you today! 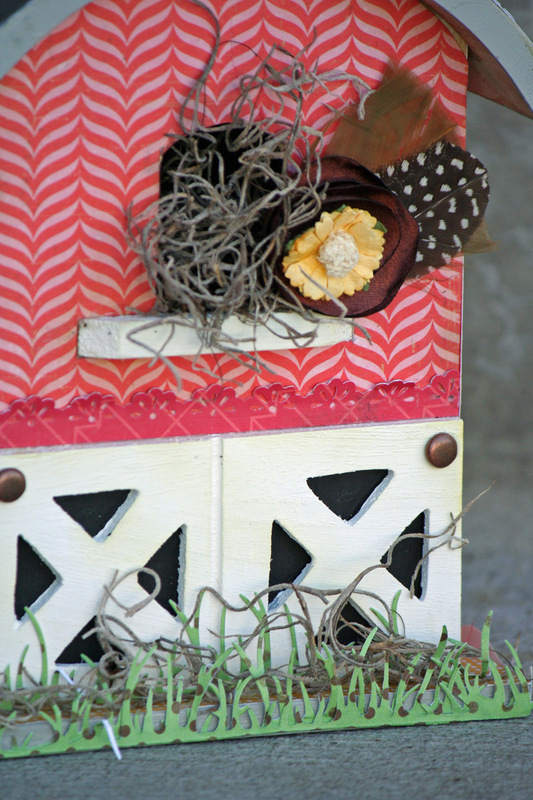 I love making altered items for our home and as gifts so I am always on the look out for great finds! I recently picked up this cute box at the Christmas Tree Shop for only $3.99! Such a deal! Here is a quick video tutorial to show you how!